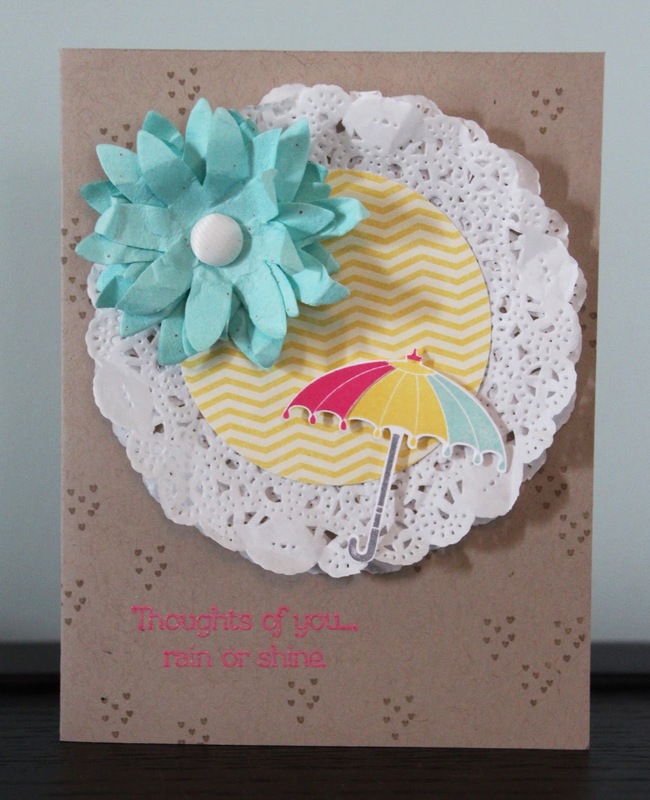 This week both my projects feature the Rain or Shine stamp set and the Sunshine & Sprinkles Designer Series paper. I am loving the versatility of the Sunshine & Sprinkles Designer Series paper. I can't seem to get enough of it lately and have been using it on all my projects! First up is a scrapbook page of my son Jakob. I've actually had this picture laying around for awhile. I just couldn't find the perfect product to use with it - until now! The cute umbrellas and the embossed clouds fit perfectly with this picture of Jakob in his raincoat. I am also really enjoying the new washi tape and seem to use it on everything! My second project this week is a card. I stamped the tiny little hearts in Crumb Cake onto the background and heat embossed the saying in Melon Mambo. I stamped the umbrella in 3 different colors and then cut out each section. Thanks for hopping along with us this week. I hope you have enjoyed this week's projects. Please continue on to Cindy's blog to see what she has created this week! I love these projects, Amy! 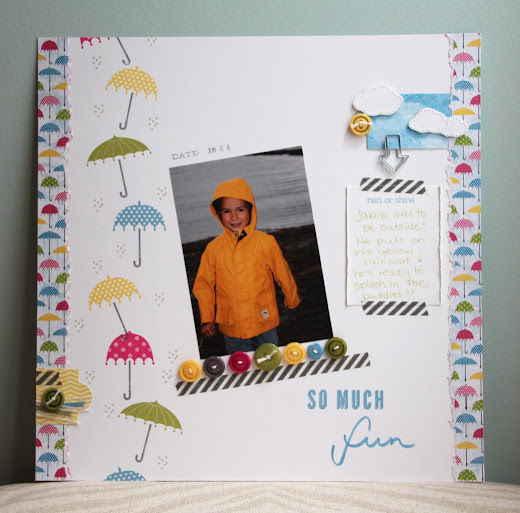 Such a cute scrap page with all of the little details :) The card is pretty darling too! Love the scrapbook page Amy! Such a cute picture, and love how you used the washi tape. And, I love the multicolored umbrella...so clever! i ALWAYS look forward to your SB pages! this one is adorable!! I am so going to CASE it!! Awesome job! I love everything you made this month! Your style is so in sync with mine. LOVE IT! Great projects! The scrapbook page is "so much fun"! OH, Amy, these are fabulous projects! I LOVE your scrap page and the row of umbrellas and tiny hearts. The cute tri-colored umbrella is a stroke of genius!